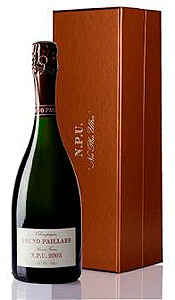 Bruno Paillard and his daughter, Alice, recently revealed the latest release of NPU, Nec Plus Ultra. This prestige cuvée, Bruno admits, was born out of a challenge put to him by the UK trade several decades earlier to create the ultimate expression of Champagne, employing the highest levels of winemaking without any financial constraints. It is questionable whether Bruno adhered strictly to the first rule for this latest release: 2003 was a challenging vintage. The year was characterized by unusually harsh spring frosts, several hailstorms, and a long heat wave. And yet the Paillards claimed that the most difficult element they had to overcome was the preconceived notion that no great wine could result from this vintage. The grapes—all 100 percent organic Chardonnay and Pinot Noir—were sourced from four of Champagne’s 17 grands crus: Oger, Chouilly, Verzenay, and Mailly, all fairly far north in Champagne, where the effects of the heat wave were moderated. Alice explained that their commitment to produce an NPU from 2003 came from paying attention to the quality of the grapes they sourced and what they tasted in the glass. Following their next six rules for a prestige cuvée turned the challenge into an opportunity. The 2003 NPU displayed a deep, golden hue with tiny persistent bubbles. The nose was an expressive bouquet of marzipan, honey, toasty oak, and white floral notes. A gentle, creamy mousse expanded across the palate, cut by a linear freshness and followed by a long finish of candied orange peel and gingerbread. The wine proved to be a versatile and successful partner not only for the proposed courses but also for the aged Comté that followed. The 2003 vintage is the fifth release of NPU following 1990, 1995, 1996, and 1999. Alice and Bruno let us in on a little secret; they did not skip the phenomenal 2002 vintage, which has been awaiting its ideal moment and will be released soon.